A commander of Bosnian Croat forces during the Bosnian War has died from drinking what he claimed to be poison at the war crimes court for the former Yugoslavia in The Hague. The death on Wednesday was first reported by Croatian state TV and later confirmed by the tribunal’s spokesperson. The judge suspended the hearing and called for a doctor. 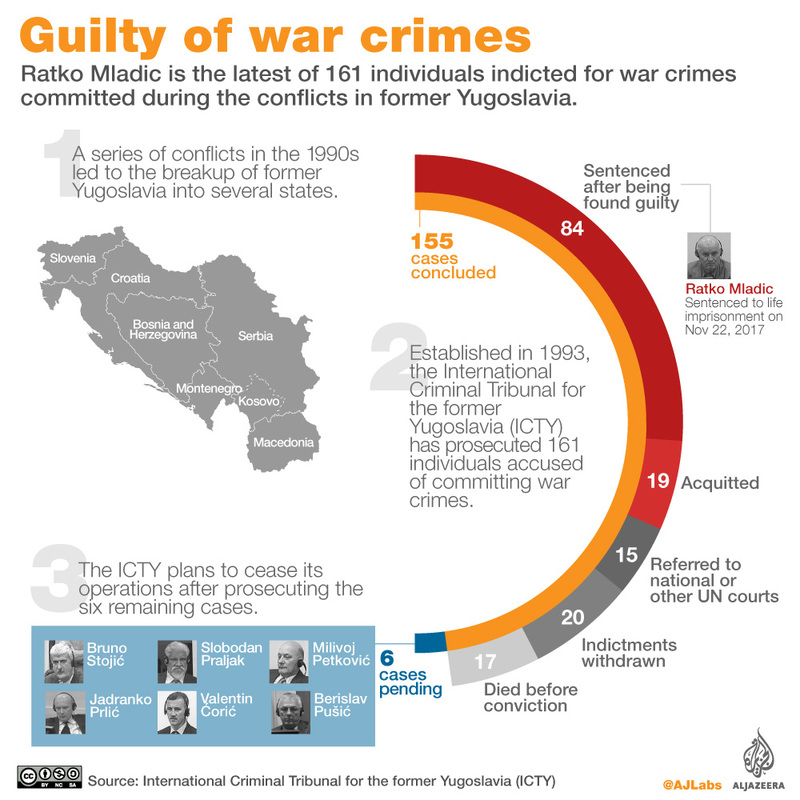 The incident happened when the International Criminal Tribunal for the former Yugoslavia (ICTY) was handing down its last judgment in an appeal by six Bosnian Croat political and military leaders, who were convicted in 2013 of persecuting, expelling and murdering Bosnian Muslims during the 1992-1995 war. Speaking to Al Jazeera from Sarajevo in Bosnia, Denis Dzidic, deputy editor for the Detecor project, said policemen and an ambulance were ordered to the tribunal building. “Slobodan Praljak had his first instance verdict confirmed, in which he was sentenced to 20 years in prison,” Dzidic said. “He said that he did not accept the verdict, that he was not a war criminal and then drank the substance. 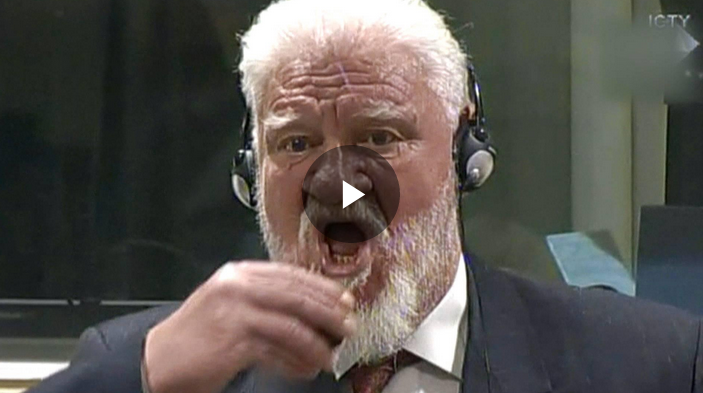 “The judge then paused the proceedings and ordered the glass [from which Praljak drank] not be taken from court. Later on Wednesday, the judges continued reading out the final verdict, also upholding the jail terms against the other three defendants. All six – including Jadranko Prlic, the former prime minister of the the breakaway Bosnian Croat statelet, known as Herzeg-Bosnia – had been sentenced in 2013 to a total of 111 years in prison. The tribunal on Wednesday confirmed that there was an internationally armed conflict in Bosnia and Herzegovina and that Croatia – by controlling the Bosnian Croat armed forces, the “Croatian Defence Council” (HVO) – had held Herzeg-Bosnia’s eight municipalities “under occupation”. “There are numerous indications that, acting through the Croatian Defence Council, Croatia had real authority,” said presiding Judge Carmel Agius. The original conviction had also said that Franjo Tudjman, the late Croatian president, was a key member of a plan to create a Croat mini-state in Bosnia. The ICTY upheld the 2013 ruling that the six officials, along with Tudjman, were part of the Croatian “joint criminal enterprise”, which aimed for a “unification of the Croatian people” and persecuted Bosnian Muslims from areas in Bosnia and Herzegovina in order to create a “Greater Croatia”. Edin Batlak, of the Association of Concentration Camp Survivors of Mostar, said the verdict had “met his expectations”. “I’m satisfied,” he said. “I believe these kind of verdicts will help in relations between Bosnia and Herzegovina and Croatia,” added Batlak. “Bad politics received its verdict. Croatia needs to be completely honest towards Bosnia and Herzegovina … and to protect and respect its sovereignty and integrity. Wednesday’s hearing was the final case to be completed at the ICTY before it closes its doors next month. The tribunal, which last week convicted former Bosnian Serb military chief General Ratko Mladic of genocide and other crimes, was set up in 1993 while fighting still raged in the former Yugoslavia. It indicted 161 suspects and convicted 90 of them. With reporting by Mersiha Gadzo in Sarajevo, Bosnia.